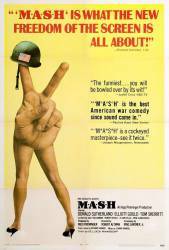 Revealing mistake: Near the end of the film, there is a football game played between the rival MASH units. Although the game is supposed to be taking place in a remote location of Korea in 1951, late model 1960's automobiles can be seen driving on a nearby highway as the game progresses. This gave away the fact that the football scenes were shot at a university in Southern California. Factual error: When Hawkeye and Trapper arrive in Japan, as they approach the hospital in a Jeep, you can see a football field in the background. Look closely at the goalpost on the field. Instead of looking like an "H" (then in use), it is in the style used since the late 1960s: a bent single goalpost, a crossbar, and the uprights. Factual error: In the football game scene, the players all have helmets with modern style (1970's) face guards.In 1951, the time period of the film, no face guards were used. Continuity mistake: Towards the beginning of the film, Hawkeye steals a jeep and drives off, splattering mud everywhere. When the local commander shouts to the MPs to "get that guy", the next shot shows them driving off onto totally dry ground; in fact, when their jeep abruptly stops, there is dust everywhere. Revealing mistake: When the helicopter that takes the departing nurse that took care of Painless is in a close up, and as it turns away from the camera, you can see the reflection of the lights for the camera. Continuity mistake: When the lady reporter is filming Hawkeye from her truck, she's approaching his position. After passing by him, she turns in the truck to keep him in range, filming backwards. But the movie camera angle filming Hawkeye is always approaching him, and at a slower speed than the reporter's truck was moving. Factual error: Early in the movie, the loudspeaker announcer states that the Korean War was the #1 news item of 1951. Later in the movie it is announced that the night's movie is scheduled to be "The Glory Brigade" starring Victor Mature. However, that movie was released in May of 1953. Hawkeye Pierce: It's a good thing you have a nice body, nurse, otherwise they'd get rid of you quick. Robert Altman originally wanted Elliot Gould to play Duke Forrest; it was only at Gould's request that he played Trapper John.